This section covers the Nelson Lakes national park. With only 11km on pretty flat ground to cover, I had a lie in at the hostel and left after lunch at the Clinker Cafe. Ali and Liv and the Swedish had the same plan to go to the first hut only today, so it was nice to be back with them all on the trail. A path led from the back of the Travers Sabine Lodge along the river to the lake where I picked up the lakeside trail. It was still twisty with roots and mud but generally nice and wide and pretty flat, which made a stark contrast from the last week’s walking. The trail stuck close to the shore of the lake, which had a few water skiers whizzing around on, and families picnicking in secluded beach sections. Near the end of the lake the Swedish caught me up, as well as Mike who I had last seen in a post office in Wellington. At the end there was a jetty with a dozen black swans swimming nearby. I’m yet to see a white swan in New Zealand. We reached Lakehead hut mid afternoon and settled in. It was hot inside but the viscious sandflies meant sitting outside wasn’t attractive. The huts in the Nelson Lakes are generally much bigger than those in the Richmonds, which were built for hunters not hikers. We even had a tap and a sink inside the hut. It soon filled up as weekenders and those doing the Travers-Sabine circuit arrived, as well as an American couple doing the TA, who chose to camp. I hadn’t slept particularly well but was the first to leave the hut. After a few minutes I wondered if I’d gone the wrong way as the map shows the path sticking to the forest edge of the valley but the orange poles were taking me through the meadow right in the middle, which wasn’t on the map. It was going in the right direction, but I walked quickly in case I had to detour back to the right path later. It was easy going anyway, with a flat, clear track. The sun hadn’t made it into the valley yet so it was nice and cool. I think it’s my favourite time to walk, between 7 and 9am. The path on the ground ended up realigning with the path on the map, and went into pretty woodland following the river at the end of the valley. It was a gentle uphill, with a few steep sections, but very manageable. I felt like myself again, very different to the second half of the Richmonds. It’s amazing how much easier hiking is when you’re able to eat and drink. I had lunch at John Tait hut and the others trickled in afterwards. The trail got steeper as the day went on but it didn’t get as steep as I was expecting from the elevation profile. Every now and then the trail would cross avalanche paths, marked with signs at the beginning and end, and every other orange triangle would have an exclamation mark to remind you not to dally. They were a danger from May to November mostly, and there was no snow left on the peaks now except small patches in gullies. I reached a signpost to Travers falls 80m away so dropped my bag down and scampered down to have a look, regretting also leaving my poles on the way back up. Clouds were forming which kept it cooler, and I was mostly in the dappled shade of the woods, but I was still dripping with sweat as the path got steeper towards the Upper Travers hut. After one last avalanche path section the trail opened to a flat but rocky meadow and the hut came into view, nestled beneath the high mountains. I made it to the hut just as it started to rain. The hut was lovely, with two sleeping rooms off of the cooking room, and big windows looking down the valley. The others arrived a bit later and we had an English room and a Swedish room for sleeping – it ended up just being the 8 of us which was lovely and spacious. Two American girls who arrived late afternoon had been considering going to the saddle and coming back down but we thought it was too late as thunderstorms were likely after the heat and you wouldn’t want to be up there in a storm. They ended up walking back down the valley, and a big thunderstorm did indeed come through, making the hut tremble with the thunder and lightning flashing around. Warm and dry in the hut, it was spectacular to watch. When we could last check the forecast back in St Arnaud the forecast was good for our couple days of high passes, so I set off for the Travers Saddle. It was only 500m of ascent from the hut to the top, so I was happy to be doing it in these stages, breaking up the climb rather than starting from John Tait today. It didn’t even feel like 500m of climbing though, and after an hour of steady plodding I was standing on top of the mountain pass in the bright sunshine at 8am on a Monday morning. It was silent apart from the odd small bird, and I soaked in the beautiful panorama of peaks, grinning to myself. I started off down the descent, and remembering when my parents did the Tour de Mont Blanc how my dad said he got phone signal a little below the peak but not on it, I checked again after 10 minutes of descent and a little 4G popped up. I checked the forecast and it was still looking good. After descending across a few rocky sections the path entered the forest. The trouble with being the first person on the trail is that no one else has broken all the spider webs yet, so I was pulling sticky cobwebs off my arms and face for a lot of the way down. It was a long and steep descent. There had been a fair bit of rain in the thunderstorm yesterday afternoon and the mud was slippy in places. A footbridge led me over the river which was down a deep and narrow gorge. On the map this section was pretty flat, but it was very undulating – NZ contour lines are 20m, not the 10m I’m used to with UK OS maps. 20m can hide all sorts of mischief. It was another steep drop down to the river, then lunch in West Sabine hut. The others arrived as I was leaving and I set off back into the forest. It wound gently uphill next to the river, interspersed with some steeper sections. At one point I turned a corner and had to stop completely, the way blocked by an assortment of boulders and fallen trees. I scanned around for signs of an orange triangle, hoping it was off to the side, around the mess. I spotted one on the far side and swore a bit but grinned. My obstacle course race training would finally pay off! Though it was a bit interesting with a big backpack. With a final, mean, steep climb, the path left the forest at Blue Lake hut. Blue Lake hut is 100m from Blue Lake, the clearest freshwater body of water found on the planet, with visibility of 70-80m. I lay down for a bit in the hut first and chatted to 3 Kiwi guys on their uni summer break who were doing some hiking sections. I went to the lake when the girls arrived, and it was pretty spectacular. The sun came out again and the lake was bright blue and green, and you could see to the bottom in the middle from the shore. We remarked how amazing it was that it was so understated – elsewhere this would be a major tourist attraction with an ice cream van, but here it was just the 3 of us and we’d had to walk 3 days to see it. An initial steep climb through a slither of forest brought us up from Blue Lake to Lake Constance. Following the cairns and what looked like a trodden path when I couldn’t see any more orange (signage had been a bit scarcer in the past couple of days) I was halfway across a loose scree slope, with 2 American girls catching up, when we realised we were far too low. On the app the path went higher above the lake still and we’d come down. Scanning around I spotted a tiny orange pole high up the scree slope. We started climbing up, one of them went to cut across a rock face but I went back across the scree slope. By this point the Swedish were starting up the proper path higher up the slope, but Ali and Liv had made the same mistake as us. Some of the paths on the TA have been pretty sketchy, but you know you’re meant to be there and the risk is calculated. It’s not a good feeling when you realise you’re on a pretty sketchy scree slope and realise you’re not meant to be there. I slid down a few metres at one point, but got back to the path unscathed. Later the trail did indeed go down to the lake shore and I got to watch the sun rise over the peaks again. It was a walk along the rocky beach then following a source stream up a dead-end valley. I couldn’t see any orange yet up any of the slopes, but none of the mountain faces looked particularly inviting. The Americans were faster and I spotted them starting up a steep climb. I stopped at the bottom and filtered some more water as there’d be no rivers for a few hours. Ali and Liv did the same, though Liv got swarmed by bees (maybe a yellow T shirt wasn’t the best idea). It was a slow plod up a very steep rock/grass steps, and then a terrifying traverse of a very loose scree slope. There wasn’t much of a ledge compacted and it was quite a steep climb across still. It felt like the whole mountain side could slide at any moment, and with each step you fell down a little. I tried not to look down. It was slow progress but I made it to the edge of the scree and didn’t stop until I’d put some distance between me and it, as if it could still sweep me away. The views back towards Lake Constance were beautiful. There was a rocky plateau to cross then a final steep scree climb to the top, this one thankfully less loose and less over a cliff. The views from the top of the Waiau pass were stunning, and there wasn’t a breath of wind. The descent began steep and rocky, having to reverse rock climb down at points. Once, I couldn’t see the next orange pole and I had a choice of 2 paths. I called up to Ali and Liv behind to see if they could see one, but they couldn’t so I set off down the left. A little later Ali called that they found one, down the right hand path. The sensible thing would probably have been to climb back up. However, I had a feeling that I could follow my way and curve round beyond the next rocky outcrop. It worked fine and when I made it back to an orange pole I called to the girls to let them know I’d made it, but they didn’t respond. Turned out my wrong way was actually much easier than the proper path which had been a large almost sheer rock face they’d had to slowly reverse climb down, so I’d emerged a ways below them. After lunch and more steep descent to a stream I stopped to filter more water. We were in the sun all day so I was making sure to drink lots and was dunking my hat at every opportunity. The gradient eased and followed the river down the valley, with some beautiful waterfalls. I passed through the informal camping site at Upper Waiau Forks (some flat area of ground in some trees) and waded through the rivers. There had been recent rockslides so there wasn’t much of a path across the rock fall (at the time I just thought it wasn’t very well marked, later learning it was recent and had wiped out the path) – I picked my way slowly across or stuck close to the river bed. The walking got easier and quicker after a few of the rock fall traverses, and the valley opened up into flat meadow paths, weaving in and out of the forest. There were some more river crossings, one which came up to mid thigh but wasn’t too strong. There had been some mud slides recently too, so picked my way messily through, before coming to Waiau Hut. It had only been officially opened 3 days ago, funded by a private donor to replace the ailing Caroline Creek bivy. We were grateful, but it was an odd place for a new hut – on a flood plain. It also had a large sandfly population. Steffi and Holgar were already in the hut, and with the girls and all the Swedish we had 2 on the floor and 2 camping. I took my head torch as I went to the toilet in the night, but didn’t need it. It was the night before the super-blood-blue-moon and it was so bright I had a shadow. Somehow the stars were also visible, and I marvelled at the moonlit mountains and night sky. Come morning and I practically ran away from the hut – a swarm of sandflies descended on me whilst doing up my shoes that I had to just tie them loosely and get away. I stopped a few minutes later before a muddy section to re-tie them. Today was somewhat of an anomaly for the TA. The path was flat and easy. It made for fast walking and I ended up doing the 26km in 6 hours (my times have been end to end times, including all stops). Those that have done the north island said they’d never had a day like it in the north. It was the first day my thoughts could wander, rather than concentrating on every foot step and not dying. The path was mostly in meadows and even merged with a 4WD track. There were quite a few river crossings but none gave any trouble considering the lack of heavy rain in the last week or so. I reached Anne hut by 1.15pm and considered carrying on to the next one to shorter tomorrow’s day in the rain forecast, but the signpost said 6 hours. Besides, Anne hut was very nice and all my friends would be there. It was big, clean, and importantly all the windows had sandfly netting. It was very exposed up on a high plain, and the wind was howling. Signing and reading the hut book we saw a note from Min, a day ahead, congratulating and encouraging us “Team England and Team Sweden” for getting this far and almost to Boyle, which made us all smile. A while later once everyone had arrived a laden horse and rider came into view up the meadow. Sean was a living stereotype, riding in gumboots (wellies), shorts, with a grizzled beard and a wicked grin. He let his horse, No Name, graze freely around the hut as he came in for a brew. I could have talked to him for hours – we chatted about the TA, the rise in numbers and what it might mean for NZ tourism and infrastructure. He had tried to retire but was working with the DOC to establish the equivalent of the TA for horses, reopening old stock tracks and putting up signage (a lot of the time the horse route would be in the river). He was favourable to the rise of the TA, arguing that TA hikers were spending money locally and often in cash, whereas NZ had lots of foreign package tour groups all prepaid which didn’t always put much into the local economy. We also talked about UK walks – he’d done the south west coast path and the Pennine Way. He rode off through the meadows (on a horse with no name…) with a wave. We played several rounds of different card games, and I managed to get my 3rd bee sting of the trip – there were a few trapped inside by the windows and I scratched my foot without realising a bee had wandered on to it, and yelped as it stung my finger. Group yoga session, dinner, and we were in bed by 8.30. The wind had been howling in the night, and we were up at 5.30am, half an hour earlier than usual, as today was going to be our longest day at around 30km, and we had to be at Boyle by 5pm. The signs said 10 hours, and we didn’t want to be late. The Swedish had got up at 5am, much to Holgar’s disproval. It was windy and drizzling but I took my rain jacket off as I was getting too hot. The rain increased and I did get absolutely soaked in the undulating meadow walk in to Anne Saddle, but skin dries and I wasn’t cold. The climb to the saddle was manageable and the steeper section wasn’t very long. I did put my jacket back on further down the descent when I wasn’t working so hard. I then took it off again a while later when the rain stopped and I got too hot. One of those days. I’d discovered a new gear of walking in the last few days, and Sofia pointed out how much the heat exhaustion must have affected me given the stark contrast in speed. And I felt tired but pretty good at the end of the days. It was downhill to Boyle but with some steep climbs over forested bluffs, and the meadow paths were pretty boggy. As the long grass was soaking I had wet feet all day. It was still pretty easy walking though. I took respite in Boyle Flat hut for lunch then carried on, jacket back on as the rain intensified. A swingbridge took the path into a long forest section. The rain eased but the wind increased. Jacket off. The path undulated through the trees, curving round into a new valley. I had to climb over 3 or 4 big trees that had evidently fallen down earlier in the day across the path, and saw several more topple with loud crashes and creaks around me. When the path left the forest briefly to cross a meadow and I came across some cow pats I contemplated whether I’d rather have to go through a field of cows or a tree-falling forest. The cows won. I practically ran the last 5km out of the forest, but it still felt like eternity and there wasn’t a lot I could do about the odds of being under a tree. A swingbridge took the path across the gorge, in another forest track, before spitting me out at Boyle Outdoor Education Centre. I retrieved my resupply box and the gas and food I’d ordered, dumped my things in a room and had a delicious shower. The centre only had a shed for TA walkers with about 10 beds, so not enough for all of us coming from Anne Hut. They’d lost power from the storm and were running off a generator. 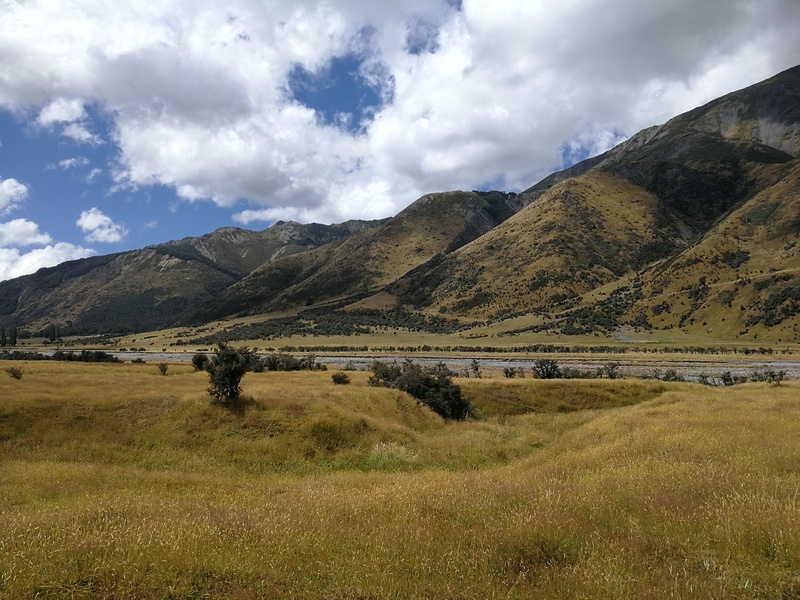 Once the others arrived (and shared near-death tree-related stories) we then decided to hitch straight to Hanmer Springs, given the good time we had made and the lack of amenities at Boyle. I paid for the shower and repacked my things, and joined the others hitching. Half of us hid in the bus shelter so as not to put off potential lifts given the number of us. We got a lift in 15 mins for 4 of us, who kindly took us all the way, 20 mins in the wrong direction for him as it’s off the main road. He knew all about the TA and had picked us up to hear about it, figuring we must be doing it as those finishing the St James Walk at Boyle usually prearranged private transport. We happily chatted about our experiences and he told us about his ultra running escapades. Arriving at the backpackers I decided to stay for 3 nights to have 2 full days in town. Min, Mike and Jay were all in the hostel too having arrived a day or two before. Min was finished with her walking break and was off to her new monastery in California next week. I had dinner with Ali and Liv in Saints, a restaurant that a kiwi father and sun we met in Lakehead Hut had recommended, and it was glorious. We met up with the Swedish in a pub later. Two rest days in Hanmer Springs, sleeping, eating, resupplying and waiting out heavy rain causing the rivers we need to cross in the next section to be in flood.